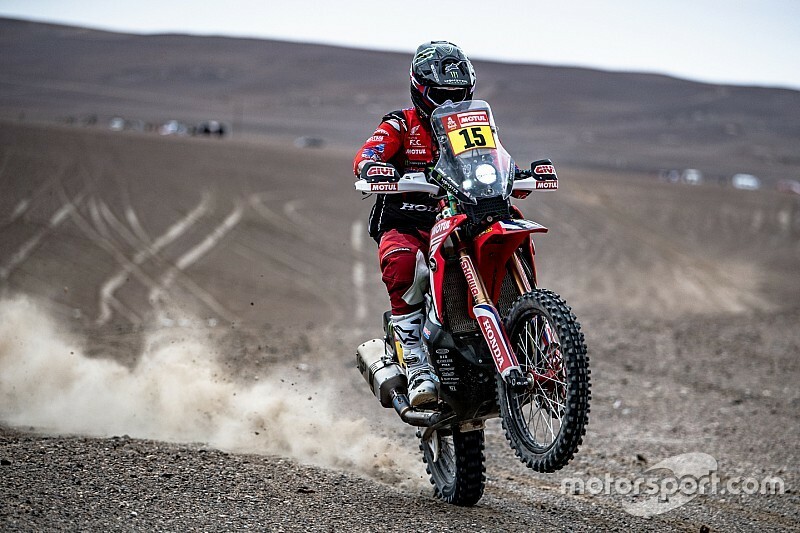 Honda rider Ricky Brabec topped the fourth stage of the 2019 Dakar Rally and snatched the overall lead from Husqvarna's Pablo Quintanilla. 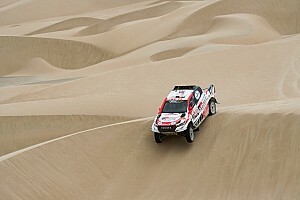 The 406km stage, which was split by a neutralised zone, was led by Brabec at every waypoint and the American scored his second Dakar stage win by 6m19s. Like in Stage 2, where Brabec also spent the most time in the lead before falling behind, Matthias Walkner was closest to the American - but this time the reigning champion had to settle for second on the day. Both riders made up for getting lost during a difficult Stage 3, with Brabec now moving up to the lead from seventh, as he took advantage of Quintanilla having a poor day. The Husqvarna rider started the day with an 11-minute gap over his rivals but was over 20 minutes slower than Brabec on Stage 4, falling 2m19s behind him in the general classification. Walkner's KTM teammates Toby Price and Sam Sunderland ended the stage third and fourth and also occupy those places in the overall order, just four and five minutes behind Brabec respectively. Adrien Van Beveren led Yamaha's efforts in fifth on the day as Stage 3 winner Xavier De Soultrait struggled, two and a half minutes slower than even Quintanilla. This leaves van Beveren fifth in the general classification, ahead of Honda's Kevin Benavides - who was matching the stage leaders' pace before losing seven minutes before the second checkpoint. Walkner is seventh overall, but sits only nine minutes and 31 seconds adrift of Brabec. 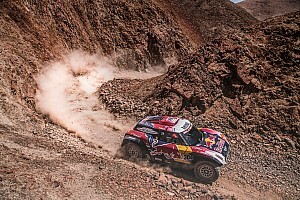 Nicolas Cavigliasso returned to winning ways in the quad class and took his third win of the 2019 Dakar Rally in Stage 4, further extending his dominant lead. Cavigliasso, who won the first two stages of the event and was a close second on the third, was only the fourth fastest in the early parts of the Thursday stage with Tomas Kubiena setting the pace. But Kubiena started to dramatically drop back in the second part of the run and Cavigliasso consequently established himself in the lead. He eventually ended with a 4m11s gap over fellow Yamaha rider Jeremias Gonzalez, extending his lead over him to 34m03s in the standings. Frenchman Alexandre Giroud in third was the only non-Argentinian racer in the top six, which was completed by Manuel Andujar, Gustavo Gallego and Sebastian Hansen. 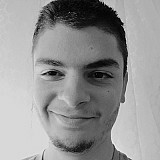 The latter kept his third place in the overall order as Giovanni Enrico fell out of contention, losing over four hours at the beginning of the stage. Giroud moved up to fourth as a result, but he is already over an hour behind Cavigliasso.